Trypticon. Omega Supreme. Scorponok—three of the biggest Transformers toys ever made. Hasbro wants to bring one of them back, and it’s up to fans to decide. This is not going to be easy. Following up on 2015’s hugely successful Combiner Wars line, Hasbro has massive plans for the Transformers Generations Titans Return in 2016. We’ve got a whole line of Headmasters toys (now called Titan Masters) on the way, a new version of Power Master Optimus Prime and the return of the biggest ‘bot ever, Fortress Maxiumus, confirmed for release next fall. The company promises big toys, but big toys cost big money to make, and Hasbro wants to be sure fans are getting figures they are going to buy. So instead of just releasing Scorponok, Omega Supreme and Trypticon, they’re letting fans pick one. Starting November 24 fans will be able to cast their vote on the Hasbro Facebook page. Chinese fans, traditionally left out of fan voting due to access restrictions, will be able to vote via WeChat, with their ballots being added to Facebook totals to determine who wins. First we have Trypticon, as seen via his official photo over at the Transformers Wiki, my favorite place to veg. Trypticon is the Decepticon fort/city bot, released as an opponent for the Autobot’s Metroplex. Outside of a transforming laser mouse and a redecoed Legends figure bearing the name, we’ve not gotten a new version of Trypticon since the toy’s 1986 debut. I’d say it’s about time. Omega Supreme was the first massive Transformer released, and also one of the first that required extra bits be added on to his main body to make him a robot. According to Taco Bell naming conventions, he is just a regular Omega with sour cream and tomatoes. We last saw a new Omega Supreme toy in 2004, when the character appeared in Transformers: Energon as a combo train and battleship. I’ve still got him on my shelf. Lots of people hate him, so maybe it’s time for another go. This Headmaster figure is the biggest first generation Decepticon, direct opposition to the Autobot’s Fortress Maximus. Since the early days we’ve seen plenty of Scorponok. He was dumb and ugly in Beast Wars, a menace in Transformers Energon, and an incredibly long scene in the first Transformers movie. We do not need any more Scorponok. Looking at all three, I’d say Trypticon’s time has finally come, though I’m sure there will be those who’d rather see Fortress Maximus squaring off against Scorponok once more. Don’t be sad, Omega Supreme. At least you’ve still got your best buds the Constructicons. 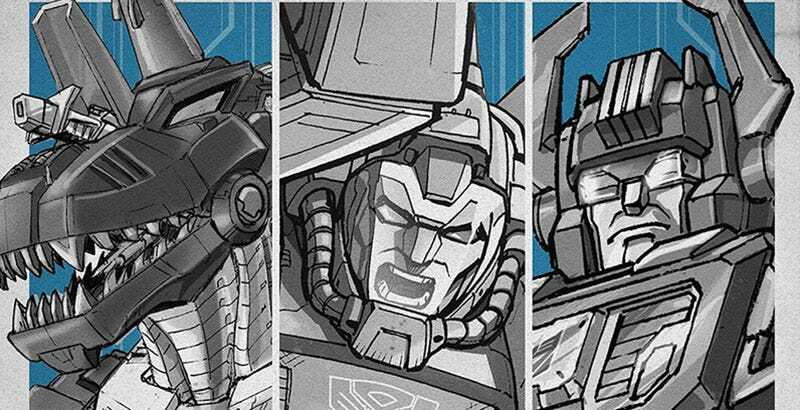 Honestly it would be silly for Hasbro to not make all three of these, so I expect the vote will just determine who we get first. But isn’t voting fun? To contact the author of this post start talking about Transformers just about anywhere and he’ll show up, email fahey@kotaku.com or find him on Twitter@bunnyspatial.